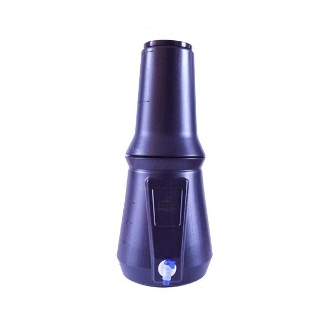 This cleanable ceramic water filter element is designed to reduce suspended solids, pathogenic bacteria, organic chemicals, and improve taste and odor. The SuperSterasyl ceramic element is available only as a "candle" (fitted with a threaded plastic cap on one end). This filter element is suitable for gravity and low pressure filter systems; it is not recommended for high pressure (high flow rate) systems. If used in pressure filters, the GAC granules may shift and ‘channelize’ which could allow water to flow through the filter without and contact with the GAC. Can be used in British Berkefeld (a.k.a. Big Berkey), NewtonWater, Katadyn, AquaRain, Epic, CWR travel filter, AquaCrock chiller/filter, Artesa, La Natural drip filter and other gravity or drip filtration systems. Higher flow rates can be achieved however, chemical reduction efficiency will suffer.